Many of my mum friends have commented and blogged about how childhood passes so quickly and you hardly notice how one phase blends into another. You have a baby and next thing you know they are off to school or university or whatever….. But these last few weeks have felt like a bit of a seismic shift for me – the converging of a few little events which means for me that things will never be the same again. It started innocently enough. Over the course of a couple of weeks I received a couple of offers for my blog asking for mums with children under 10, and I did a double take and realised that I am not in that category any more. 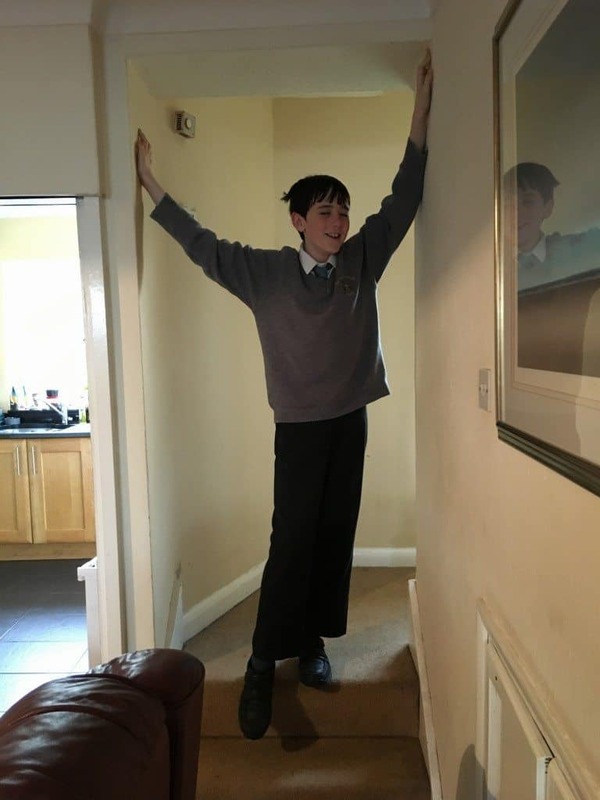 My baby son is 11 – he has passed his 11+ and is going to the secondary school of his choice in September. How on earth did that happen? Then we got the letter from school about moving into summer uniform, and I realised that the collection of grey and blue school ties, so proudly worn by both children when they first started big school, were about to be discarded for ever. 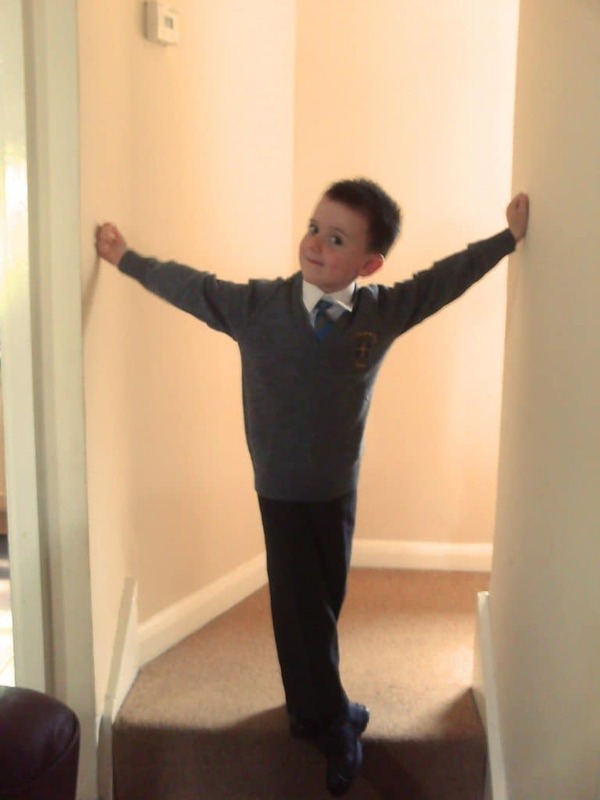 I couldn’t help myself – I had to dig out the iconic photo of my 4 year old cheeky chap when he got dressed up for school for the first time – and in true embarrassing mummy style I asked him to recreate the shot. There is the evidence clear before me – I am not a mum of small children any more – they have moved on to that hulking great pre-teen and teenage stage. A whole new different ball game, with a new set of rules. Equally fun, equally challenging, but changed for ever…. I’m not sure if I am ready. 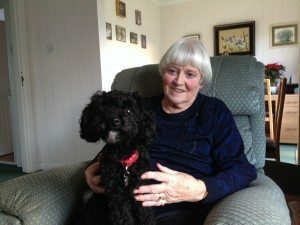 And then the parallel path….. many of you who read this blog regularly or know me on Facebook or elsewhere will know that my mum passed away last August. Over the Easter holidays I finally completed the sale of her house and moved all of her things out into storage, then last weekend we buried her ashes in the churchyard where her own parents were scattered 40 years ago. I’m ready for this now – I wasn’t sure how I would feel at the ashes scattering, but I was pleasantly surprised at how composed I was and how far back to normality I have already come after plunging into the deepest pit of grief. The move out of mum’s house and the area I grew up in was a bit more problematic for me. I knew the house had to go – and to be honest going back to it several times these last few months and not finding her there has been horrible for me and especially for the children. Clearly that house cannot be the same for us as it once was, because the heart and soul of it is missing. So, bearing that in mind, I am forcing myself to be pleased that it will now be lived in by a young family who I’m sure will bring joy and laughter back there again. Fake it till you make it, I guess. 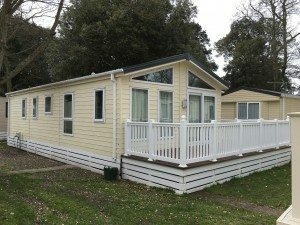 I have taken some of the money from the house and bought a beautiful holiday lodge in Mudeford, which continues my links with the area I grew up in, and will allow my family to make more happy memories on the South coast, away from the shadow of mum’s illness and death, which enveloped us all last summer. I will be letting the cottage out too – adding yet another business stream to my portfolio. If you are close to your mum and then you have children, you will know that comforting feeling of going home, how you can delegate a little bit of the mummy responsibility and fall into that wonderful relaxing space – half mummy and half child again. I had a fantastic relationship with my mum, and the fact that she lived right by the beach just made it all the more easy to spend as much holiday time as possible there, allowing me to regress back to my own carefree childhood and relax a bit. It’s only just beginning to dawn on me that I don’t have access to that carefree state any more. I don’t even have siblings that shared those times with me to look back on those days when….. Instead of an all inclusive holiday cottage by the sea with live-in cook, housekeeper and Grandma, I now have a similar holiday cottage which is gorgeous, but self catering, and requiring management of the business side too. It seems that despite my best efforts and intentions, I am now a fully paid up card-carrying grown-up, and the last little bits of my own childhood which I was clinging onto with my fingertips have now evaporated. It’s very easy for me to get all poor me about this and wallow in self pity. I know that some people don’t ever get to experience half the depth of affection and care that my mum showered on me, her only child, and I was probably spoiled rotten. My family and I have huge quantities of happy memories and I cherish all of that. But it’s certainly true that you never really appreciate exactly what you have until it is gone. I’m publishing this on what would have been my mum’s birthday – the first birthday that she didn’t get to see. So Happy Birthday to you mum, and as I raise my glass to you, I’m resolving to move on and finally close this chapter. Goodbye to eighteen months of cancer, worry, caring for a dying relative and grief. Goodbye to my own childhood and at the same time goodbye to the small child stage with my own children. I am a big bad grown up Mum Boss now, and I’m ready to move forward to what comes next.